This one is directed by Jon Favreau, written by Justin Marks, and features the voices of; Bill Murray, Ben Kingsley, Idris Elba, Lupita Nyong’o, Scarlett Johansson, Giancarlo Esposito, and Christopher Walken. 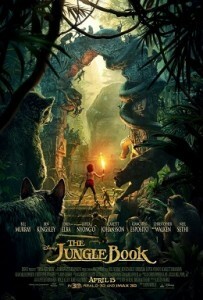 The film stars and introduces Neel Sethi as Mowgli. The good; this movie looking amazing. The use of CG here is unparallelled, Moving Picture Company and Weta Digial really out did themselves this time. The Henson Company was also utilized with the actors. The balance between photo-realistic rendered images and human emotions in the animals was perfect. The creatures moves like the jungle animals they are, but were able to talk to Mowgli in a way that didn’t look unrealistic. Not enough can be said about the look of this film. After the awe of the film’s visuals sets in, the story comes to the forefront. This version finds the balance between the 1967 version and the source material, in that it’s able to be fun and light-hearted, yet still convey how dangerous the jungle is, and can be. The score kicks in and it’s a wonderful orchestral rendition of a song you remember singing and then intense action and danger follows. It paints the jungle as both as a thing of beauty and something to be feared. Adapting the themes and views of the jungle to current times is another part of what makes this film so good, in Kipling’s original work nature is something to overcome, man conquering all. Now nature is something to be protected and revered. Bravo with finding a brilliant way to update a classic. Neel Sethi does a great job as our main character. Surrounding Mowgli is a wonderful cast who voice the other animals. Having Ben Kinsley be the narrator and the mentor of the film is sublime. The voice cast combined with the wonderful CG really fit each character. The bad; it ended. I wanted more. Overall, go see The Jungle Book in the theatres, it blends the memories of the animated musical you had as child and updates it to current times in the best ways possible. They say you can never go back home again, but this sure does come close, you’ll find yourself humming to a familiar tune, then be startled by the ferocious animals, and then you’ll be moved with emotions even though you know how it all ends. It made $103.6 million this weekend, glad people are seeing this one. PS. It was sad to hear Garry Shandling‘s voice as the porcupine. But great to hear Dr. John during the closing credits. PPS. The end credits are a great tribute to the old animated films (the original story book is used over blue flowing sheets).